<! [CDATA[Ah, sweet baby McKinley has finally arrived! I was lucky enough to be able to photograph her mama & daddy in a maternity session on Mt. Lemmon, which is one of my favorite outdoor locations to have family & maternity photography sessions. As a gorgeous couple, of course they had a sweet little cherub for a newborn baby. With beautiful brown eyes & squishy little cheeks, I was in heaven working with her during her newborn session. How could I not be? Isn’t she adorable? Miss McKinley absolutely refused to sleep during her newborn session, despite Cherish’s claims that all she ever does is sleep. Kids seem to excel at making liars out of their parents, and Miss McKinley was already off to a great start. Fortunately, she was sweet enough to be content, and look around taking in her surroundings during our time together. Our theme for this session was grey & pink. During our phone conversations I discovered that McKinley’s daddy, Jason, painted these awesome chevron stripes of grey & pink in little her nursery. So I made a trip to the fabric store & was lucky enough to find some cute pink chevron fabric to incorporate into our photo session. McKinley came back to my studio for a teal, pink & grey themed 4 month photo session. It was amazing to see how much she had changed in just a few months. Her big brown eyes had become even more beautiful and her cheeks were even more squishy. 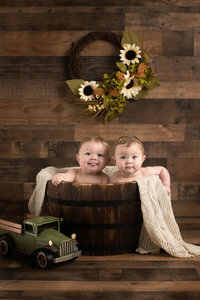 Some of my very favorite 4 month baby photos are from this session. I adore the little back rolls in so many of these photos. Then again at 8 months old, she returned to my studio for another grey & pink colored milestone session. She was so curious and was interested only in exploring the studio. She had little patience for staying put and posing for photos. Her parents and I had to work hard to get her to smile during this session. However, the payoff was well worth the effort when she gifted us with her cute little scrunchy-faced smile. This is one of those expressions that parents fall in love with, because it is just so unique to their baby at that age. And it is one of the reasons that I so love doing milestone sessions at 3, 6 & 9 months or 4 & 8 months. Now Miss McKinley’s mommy & daddy will be able to look at these photos as she grows, and remember fondly the time when she used to smile that scrunchy little smile as a baby.